I have always admired Little Steven (Steve Van Zandt). To me his actions both in the studio and out are the true epitome of what rock and roll is all about, and the power it has to be a force for good in the world. In Part 1 of this two part blog, I focused on Little Steven’s career through the end of the 1980s. For Part 2, I’ll focus on highlights from the 1990’s right up to the present. As I mentioned in Part 1, Van Zandt had lost his recording contract at the end of the 1980s. But he was still plenty busy. Through the years, Van Zandt had written and/or produced songs for other artists, including as mentioned before Southside Johnny and Bruce Springsteen (Van Zandt served as co-producer on The River and Born in the USA). Other artists that he has written and/or produced songs for include Michael Monroe, Arc Angels, Nigerian superstar Make Fashek, and Darlene Love, among others. He also produced and wrote songs for the ill-fated LA cowpunk band Lone Justice‘s second album Shelter in 1986. (As an aside, I have always loved lead singer Maria McKee‘s voice – its a real shame that things fell apart after this album). Here’s the title track, a Van Zandt song that should have been a massive hit. Towards the end the 1990s, Little Steven suddenly became insanely busy. First he went into acting, playing mob consigliere Silvio Dante in HBO‘s The Sopranos. The show’s producer, David Chase, had seen Van Zandt induct the Rascals into the Rock and Roll Hall of Fame in 1997, and was struck by his “performance” that evening. The show ran from 1999 to 2007. While not directly musical, one of the highlights of the show was the songs that would play during the ending credits each week. These include several Little Steven songs, including Affection, from a never released album he recorded with a short lived garage band he had formed called the Lost Boys. At the same time in 1999, Bruce Springsteen decided to reform the E Street Band after about a decade after breaking it up to pursue new musical directions. While Van Zandt had left the band in 1984, when Springsteen asked him to be a part of the newly reformed band, he was in. Touring behind a box set of Springsteen outtakes and alternate song versions called Tracks, the 1999 Reunion Tour highlighted the new more powerful E. Street Band, since they now had a 3 guitar line-up – Van Zandt, Nils Lofgren (who had replaced Van Zandt in 1984) and Springsteen himself (who was no slouch on the guitar). I saw Springsteen several times on this tour, and it was a real joy to able to see Little Steven as part of the band (he had left before I got to see Bruce live). Here’s one highlight from those shows, Bruce and Little Steven duetting on the River classic Two Hearts. 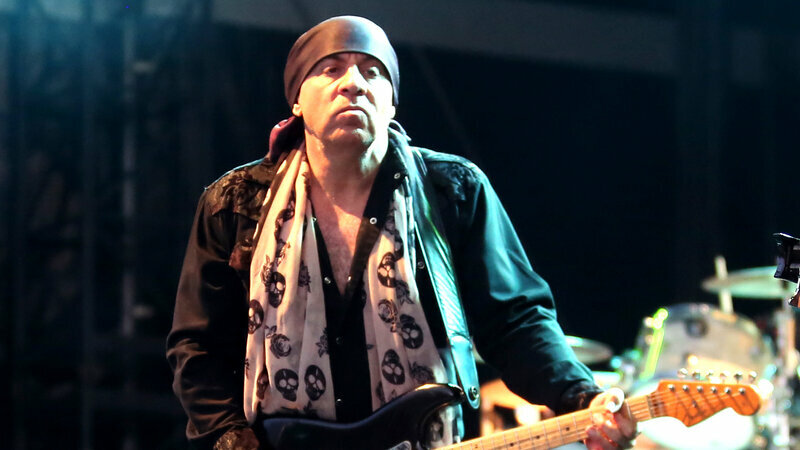 As if acting in a ground breaking TV series and touring with Springsteen weren’t enough, Little Steven also found time in 1999 to release his fifth solo album, Born Again Savage. Recorded in 1994, it was released on Little Steven’s own Renegade Nation label, and featured both Adam Clayton of U2 and Jason Bonham. A tribute to the 60s garage rock that Van Zandt loved as a teenager, it was a return to the harder rocking sound of his 1984 album Voice of America and dealt with issues of politics and religion. Here’s Salvation. Born Again Savage, and its garage rock sound was a precursor to another major endeavor of Little Steven, the creation of his syndicated radio show Little Steven’s Underground Garage. Premiering in 2002, and currently on over 80 stations in over 200 markets worldwide, the show has broadcast well over 800 episodes. Van Zandt has said that he created the show in order to showcase the type of music that was heard on the radio during his youth, especially garage rock, that you don’t hear anymore. The show, also heard on Sirius satellite radio, together with Van Zandt’s record label Wicked Cool Records, also promotes the current wave of garage and classic rock bands that you won’t hear on commercial radio. According to the Underground Garage website, over 700 bands have been showcased on the show. Here’s the humorous opening montage of the show. During the rest of the 00’s and 10’s, Little Steven kept busy DJing the Underground Garage, touring with Springsteen, and writing/producing/starring in his own Netflix show Lillyhammer (about an ex-Mafia type living witness protection style in Norway). In addition, in 2007 he founded the Rock and Roll Forever Foundationand its TeachRock project, to counter the widespread cut in arts funding seen in many school districts nationwide. Using music (including rock) and provided for free to any school who wants it, the projects uses “interdisciplinary arts-driven materials designed to keep students engaged and in school.” Again, using rock and roll to make society a better place by making learning and education fun and engaging for students! In 2016 came the exciting news that Little Steven was going back into the recording studio to work on a new album with the Disciples of Soul! The album Soulfire, was released in May 2017 and included both new and rearranged “rock and soul” songs from his previous work over the years. The resulting tour for the album began in 2017 and looks to finish up later this year. Mike and Paul of this blog got to see the show when it stopped in Philadelphia and highly recommend it – one fantastic song after another; it was great to see Little Steven in top form! One pretty cool aspect of the current tour leg is that Van Zandt has reserved a block of tickets at every show for teachers to attend free of charge, as a thank you to them for what they do educating the future generations of America. One final song choice then, off of Soulfire – here’s Saint Valentine’s Day. Classic Little Steven – I absolutely love the horn line in this one. Just like way back in 1975 and Tenth Avenue Freeze-out, it elevates the song to a higher level. Well, there you have it – my attempt to spread the love about Little Steven and all the good work he has done over the years using rock and roll as a force for good in our world. I hoped you’ve enjoyed it. I’ll close with the original liner notes that Little Steven wrote for Born Again Savage. To me they get to the core of his view of what music can mean. We live in an insane asylum. A barbaric, merciless cesspool. And in this purgatory filled with disease and ugliness and violence and hatred and injustice and greed and lies and pain and frustration and confusion there are brief, fleeting moments of peace and love and truth and beauty. They are rare. They are years and miles apart. But they are so meaningful that they make life worth living. Those moments give you strength to face the insanity with your balance intact and your eyes focused and you endure and tolerate and survive. And if you’re lucky, real lucky, you can tap that strength and hold on to it long enough to, in your own small way, try to make it all a little bit better. Just a little bit more civil and just. To serve. And you don’t do it for anybody else because no one is going to thank you or reward you or even notice. Don’t kid yourself. You do it for you. For your own soul. Because in this world that’s all the salvation you’re ever gonna get. Thank you Little Steven for all your efforts – it is noticed, and appreciated! Your music has made my life and our world a better place.